The Commission has also permitted relaxation of five percentage points in the minimum marks to be scored in the written test by SC, ST and OBC candidates. JNU had seen protests over the UGC notification which was implemented in the 2017 admission cycle. 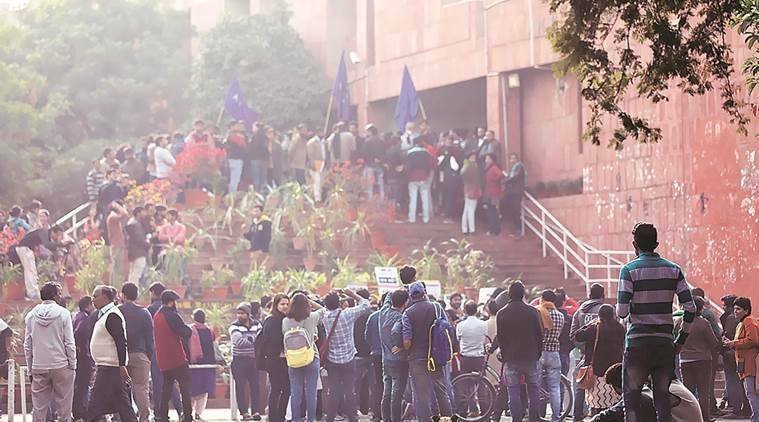 The Jawaharlal Nehru University Students’ Union (JNUSU) Friday welcomed the decision taken by the University Grants Commission (UGC) to scrap viva-voce as the sole criterion for admission to MPhil/PhD courses. On Thursday, The Indian Express had first reported that the UGC, in its full commission meeting, decided to go back to the entrance test method of selecting candidates — which gives 70% weightage to marks scored in the test and 30% to viva-voce. “The JNUSU congratulates students for two years of uncompromising and tireless struggle in the face of adversity to achieve this substantial victory. It is the determined student struggle which nailed the UGC’s anti-social justice design and forced them to retract (it),” said the JNUSU in a statement. The Commission has also permitted relaxation of five percentage points in the minimum marks to be scored in the written test by SC, ST and OBC candidates. While a general candidate will have to secure at least 50% in the test to qualify for the interview, a candidate from the reserved category will have to score 45%. JNU had seen massive protests over the UGC’s March 5, 2016, notification, which had made viva the sole factor for selection. Students had even blockaded the administrative building after the university decided to implement the system from the 2017 admission cycle. “When the Gazette was introduced in JNU in 2016, it brought massive devastation by wiping off a generation of students from research courses through arbitrary caps on supervisor-student ratios and… massive seat cuts. Even more insidious was the uniform 50% qualifying clause for written and the 100% viva, which led to a near extinction of the presence of students from the weaker sections in the research courses,” said JNUSU president Geeta Kumari. “It’s important to note that UGC’s late recognition of JNUSU’s position has cost thousands of students their future. Who will compensate two batches of students for their losses? Will the JNU V-C, who is part of the UGC team, and UGC itself apologise to students for its cynical machinations?” she said. The JNUSU also demanded that viva marks be lowered further to 15% to prevent cases of discrimination. “JNUSU would like to advise the UGC to read JNU’s well-documented Professor Nafey Committee report and several Supreme Court directives on the viva weightage issue and restrict it to 15%,” said Kumari.